I like trays, I like them a lot. I have a lot of them, but I use them all, so I think that's fair enough. I particularly like them because they have the ability to add a sense of order to a whole lot of mess. Loads of pots and bottles sitting on your dressing table? Line them up neatly on a tray and suddenly they look like they're meant to be there. A mish-mash of bottles of plonk on your sideboard? Add a tray underneath, and it gives it the look of a drinks area. 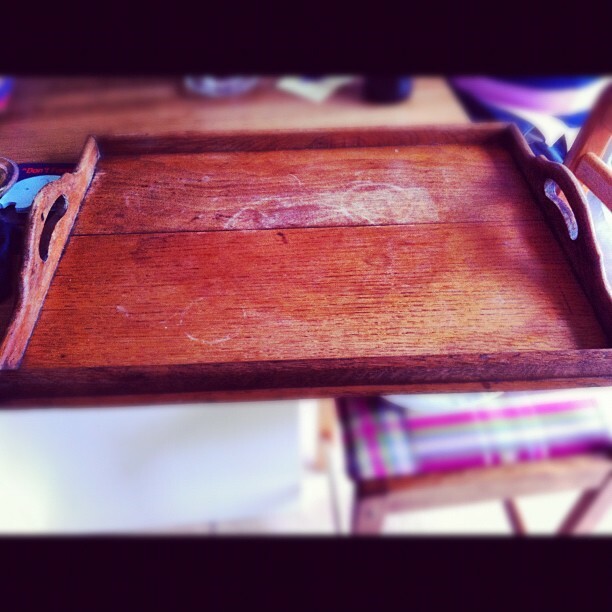 I've already blogged on here before about my glass trays, which I use by the cooker, and on my bedside table. 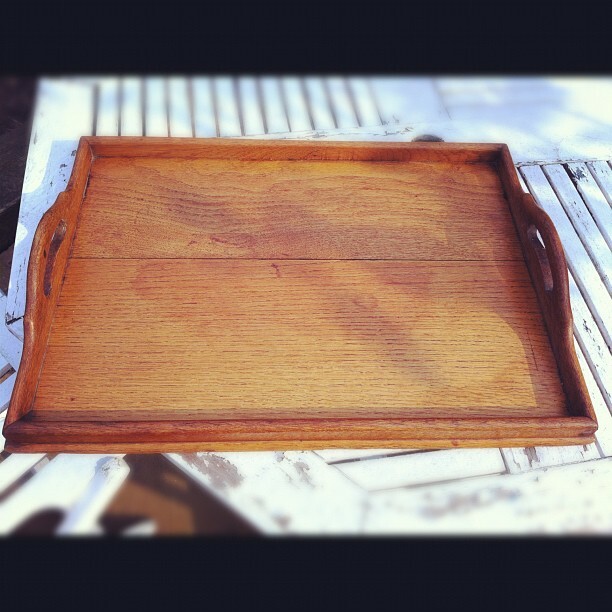 I found this tray above in a chazzy for £2. It was heavily marked, but for £2 I thought it was worth a go. I loved the size and the style of it. Because of the marks, I had thought that I might cut some patterned fabric to size and glue it into the inlay, and then maybe even get a piece of perspex cut to size to sit on top of it. But that was before I tried my Lakeland Miracle Cloth (am I starting to sound like one of this JML adverts?). My mum sent this to me, because we have a lot of wooden furniture in our house, which gets easily marked. I thought I'd give it a go, and was so eager to try it, I only remembered to take my "before" shot half-way through using it. So in the photo above, I'd already given the bottom central section a good rub with the cloth. Anyway, by the time I'd used the cloth on the whole tray, and then buffed it with a clean, dry cloth, it was looking pretty good. The shadow marks you can see below are from the tree in our garden. There are still a few faint marks on it, but I think the cloth has done well, and it's only £4.99. I'm using it in our spare bedroom / dressing room, to try and install some boundaries to the general mess and clutter, and the growing collection of Nars blushers - anyone who tells you there is a better blusher is lying. 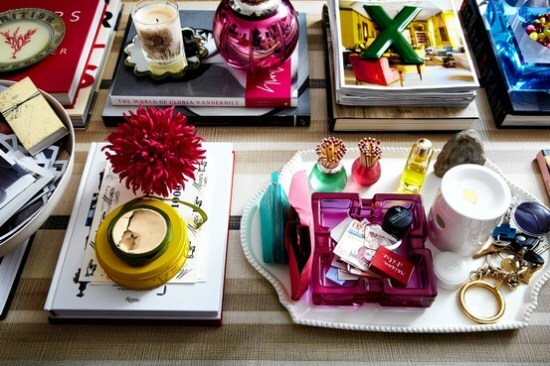 Here are some more tray set-ups for inspiration, and links to where you can find similar on the high street. Wow - this is great! 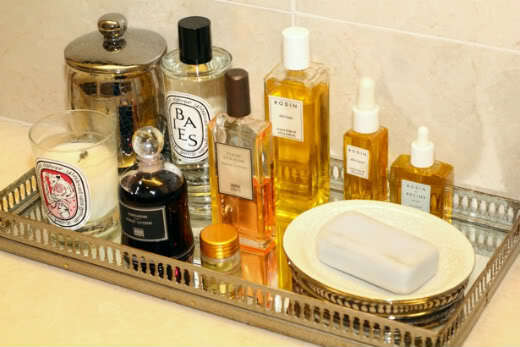 you've really inspired me to get some tray action to bring some order to my very chaotic bathroom! Have you got any tips on make-up storage? I tend to find if it's stored away I forget I've got it, so have got it all in a big moroccan bowl, but it looks a bit messy and really isn't that useful! how do you do yours? 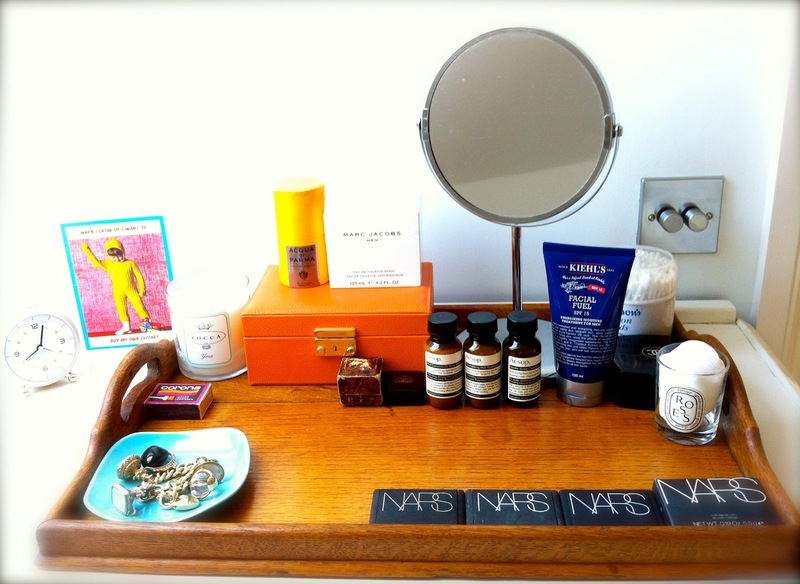 Good question - I"m planning a blog post about make-up storage. But until I get round to it... I store my make-up in these IKEA drawers which sit on top of my chest of drawers. When you're searching the websites, use words like seagrass, wicker and rattan which will bring up all the different products on offer. I know you didn't want it stored away, but because the drawers are quick to pull out and it's easy to see everything in there, I find it's the best solution, and it doesn't get dusty either. Hey - ah, thanks for this very thorough advice! I've seen those drawers from IKEA before, but for some reason they hadn't occured to me. I particularly like the tip about having drawers for different uses. Funny how these things seem obvious once someone has pointed them out! Thank you very much... looking forward to the blog post on make up storage too!